Chris Gampel began appearing on Broadway in the early 1950s. Chris Gampel ( February 19, 1921- He died on May 8, 2008 ) He was born in Montreal, Quebec, Canada as Morison Gampel. Gampel had at least eight Broadway credits between 1950-1969 He was a fixture in live television during the fifties. 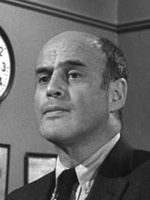 Gampel was in all the big ones: Philco Television Playhouse, Studio One, U. S. Steel Hour, Playwrights 56, Armstrong Circle Theatre, Hallmark Hall of Fame He was an actor, known for Annie Hall (1977), Death Wish (1974), Hitchcock’s The Wrong Man and The Changeling (1980). On TV he appeared on The Patty Duke Show, and Car 54, Where Are You?